Want a game of Civ VI to last even longer? One of Civ V’s famous mods, ‘Yet not Another Map Pack’, has entered alpha for Civ VI, letting players take part in a global simulation. Like Civ? You’ll like everything in our list of the best strategy games. You can play the mod in Giant size or Ludicrous, but the creator warns that both of these settings go “way above the size of the Huge map”. Even the Giant Earth map may refuse to load on PCs that aren’t up to it, or it might just take some time. Ludicrous maps take around five minutes to load. The world wasn’t built in a day. It’s recommended that you lower the graphical settings if trying to play Ludicrous, as it used 6GB of VRAM on the creator’s GPU. This map size was tested on a 500-turns game in autoplay, with 32 civs and without a crash on the modder’s PC. Here are their specs for reference:CPU: i7 4770K, RAM: 16GB, GPU: GTX 980 ti. Probably don’t try Ludicrous if your PC doesn’t come close to that. As with anything like this, you mod at your own risk, but you can grab the file in this forum thread. At the moment, Civs are bundled together based on their ethnicity, so Europeans will begin in a cluster, etc. 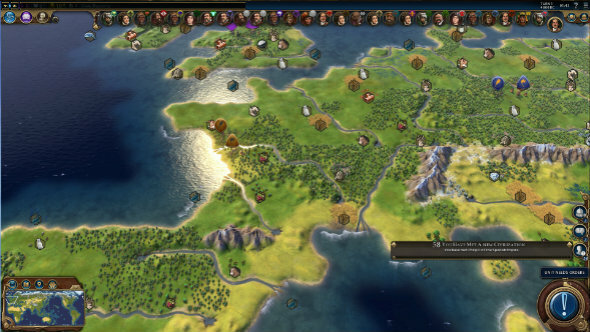 However, the modder is working on implementing true starting locations further down the line, so Civs will start in their geographic birthplaces. Go in “Additional Content” and activate it by checking the box near “Activate Mod” then click “Back” and launch a game.